While Dragon was attached to the space station, astronauts unloaded 1,146 pounds of cargo including food and other crew provisions, student experiments and a laptop that Dragon delivered from Cape Canaveral Florida. They then packed the spacecraft with 1,455 pounds of cargo that will be returned to NASA on Earth including hardware used for experiments, spacewalks and station systems. Early Thursday, at approximately 1:00 AM Pacific/4:00 AM Eastern, the space station's robotic arm will pull the spacecraft from the station. Two hours later, the robotic arm will release Dragon and the spacecraft will begin its journey home. Dragon is targeted to land in the Pacific Ocean, a few hundred miles west of Southern California, at approximately 8:44 AM Pacific/11:44 AM Eastern on Thursday, May 31st. 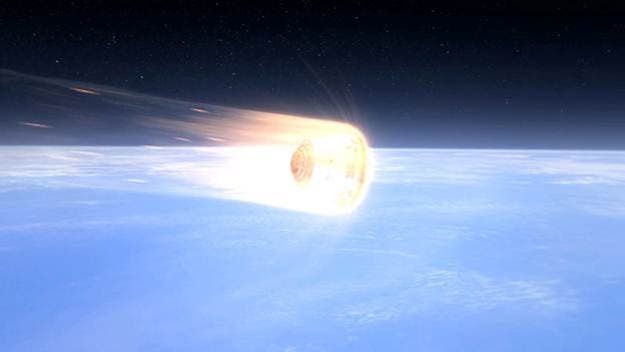 The spacecraft returns to Earth like a burning comet, protected from extreme reentry temperatures by its powerful PICA-X heat shield. The landing location is controlled by firing the Draco thrusters during reentry. In a carefully timed sequence of events, dual drogue parachutes deploy at 45,000 feet to stabilize and slow the spacecraft. Full deployment of the drogues triggers the release of the main parachutes, each 116 feet in diameter, at about 10,000 feet, with the drogues detaching from the spacecraft. Main parachutes further slow the spacecraft's descent to approximately 16 to 18 feet per second. SpaceX will use a 185-foot working barge equipped with a crane, an 80-foot crew boat, and two 25-foot rigid hull inflatable boats (RIB) to conduct recovery operations. On board will be approximately a dozen SpaceX engineers and technicians as well as a four-person dive team. The boats will be waiting just outside of the targeted landing area. Once Dragon lands in the water, the 25-foot boats will carry the experienced dive team to the floating spacecraft. They will secure the vehicle and tow it to the barge where the crane will pick it up and place it on deck. The ships will then begin the trip back to land. In the future, Dragon will use SuperDraco thrusters to land on a landing pad on ground. This is SpaceX's second demonstration flight under a 2006 Commercial Orbital Transportation Services (COTS) agreement with NASA to develop the capability to carry cargo to and from the International Space Station.